I'm stepping out of my comfort zone for this weeks Stampotique Designers Challenge. Not only with my mediums, but with the challenge itself. 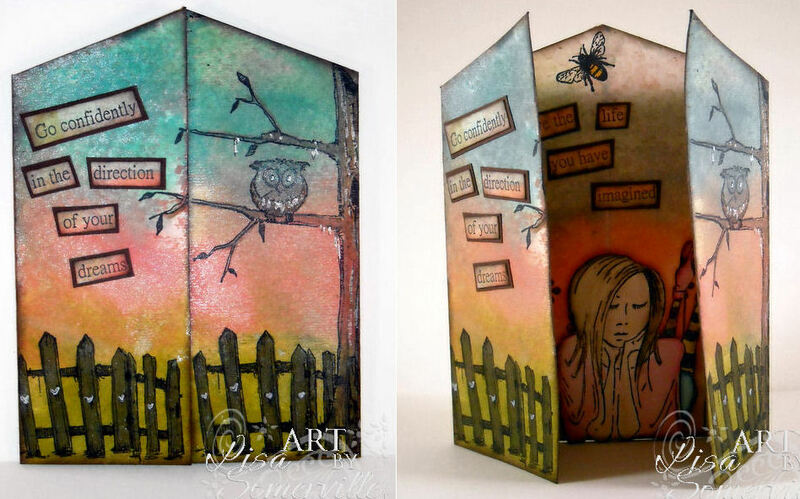 Vicki is the hostess this week and her challenge is to use your Stampotique images to create a triptych card. I can honestly tell you that I have never created one of these cards, not sure why, but they always intimidated me I guess. Not one to give up on the challenge, I grabbed some Watercolor Paper, Paint Daubers and a handful of wonderful Stampotique images (listed in details) and here's what I came up with. It will be the perfect card for DS's girlfriends graduation! Thanks for the challenge and push out of my comfort zone Vicki! To add color to the watercolor paper, I dabbed on some Ranger Paint Daubers in Pool, Mountain Rose, Willow and Lettuce, spritzed the paint with water and a spritz of Pearl Perfect Pearls mist, then smooshed onto a Non Stick Craft Sheet, lifted and heat dried. Then went to work adding stamped images in Black Archival, using a SAMJ for proper placement, and coloring with various Markers. The inside color and stamps were added the same way with the exception of Jasmin. Jasmin is stamped in Black Archival on watercolor paper, then colored using the Marker Watercoloring Technique from an older issue of the Technique Junkie Newsletter, then popped up on dimensionals. Fabulous triptych and great background, Lisa! 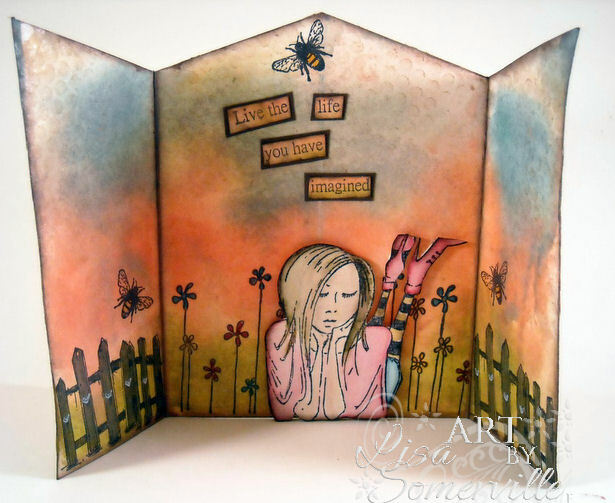 How artsy, just love what you have done Lisa, what a fun card. Glad you jumped out of the comfort zone and tried this! Wonderful colors! Lisa, this is fantastic! I hope you will step out and make more of these cards! Lisa, with your talent, you can make any type of project! I am sure of it. I love the bg colors...so beautiful. How perfect this would be for a teenage girl's birthday! I so have to remember this! No one would ever know that you had to step outside of your comfort zone for this creation? I love this and the background is amazing! Beautiful project. Love the colors and the details are fantastic. Glad you stepped outside your box on this one! Wow! Awesome! Your smooshed background is wonderful and Jasmin is adorable in the setting. You did great with the triptych. Well you made a wonderful job coming out of your comfort zone Lisa! Beautiful tryptich and what a stunning colours! Beautiful triptych, love the colors and the images.